Noticed my pool started blowing bubbles through the returns. I check the pump, and it's pulling in a fair amount of air, but not enough to lose prime. This at least tells me it's a suction side issue, not a return. This is an old 3/4 hp pump, unknown make, with a motor I replaced ~2 years ago. My first thought was maybe the seal on the pump lid was leaking, so I cleaned the gasket, lubed it, and reinstalled. Didn't help. The lid does spit a little water when the pump shuts off, so I don't know how much I trust it. So I started messing with the valves to see if I could isolate which line has the leak. I have a main drain, the skimmer box, and a suction cleaner, all coming individually to the pad. The main drain is on its own valve, the skimmer and suction lines go through a multi port valve. I turned off each in turn, and while I seemed to get less air on some, nothing completely eliminated the air. Not sure what conclusion to draw from that. I think it seemed worse when pulling from the suction cleaner. I also checked the hose on my suction cleaner to make sure it wasn't drawing in air at a joint - it seems fine. Seems unlikely that all three would start leaking at once, which makes me wonder about a common air entry point - the multiport valve? The lid on the pump itself? Should I try a new gasket before going any further? I'm concerned. I have horrific images in my head of digging up the backyard, or worse yet, breaking up the pool deck to find a leak in the PVC. Any tips for how to figure this out? Okay, daylight helped immensely, lol... I was doing this in the dark last night. 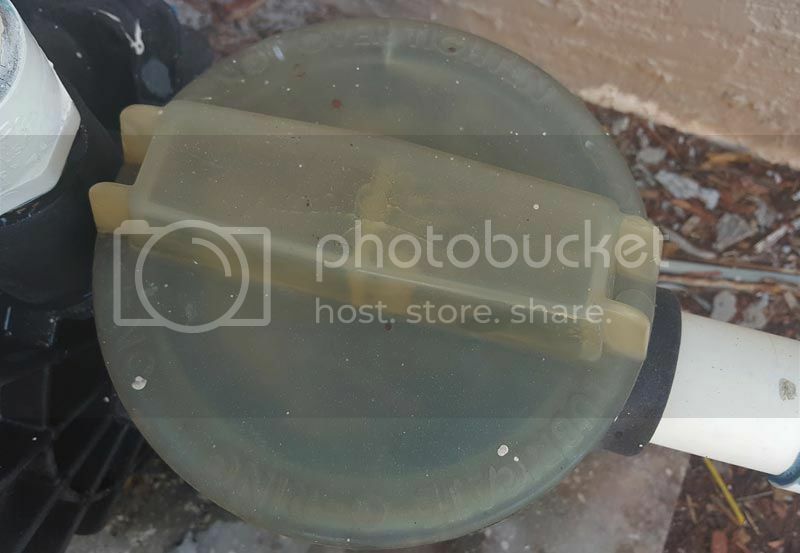 It looks like the polycarbonate lid to the pump skimmer, which is yellowing due to years of UV/sun damage, has some cracks developing. It hasn't failed, I mean, it's nearly 1/2" thick, but I can see the air bubbles drawing in through the big crack that runs to the edge. But it's just a matter of time from here. There is spider cracking at the top, but the leaking crack can be seen at the top of the picture here. 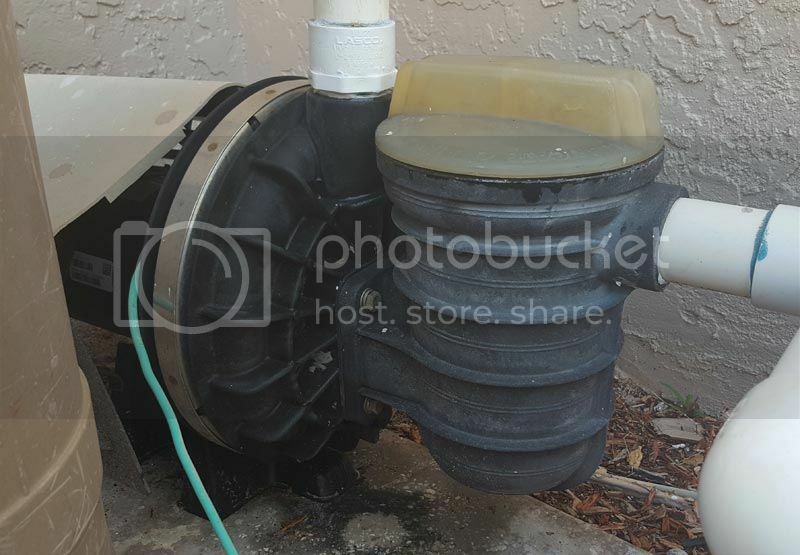 Since I have no idea what make or model pump this is, I'll probably have to carry the lid into the pool store and see if there's any chance they can identify it or provide a replacement. Unless some here has any idea? Just thinking out loud - assuming I get a thin plastic epoxy from HD or Lowes, could that work as a temporary repair on the pump lid while I decide my next move? I don't think it would hurt anything to give epoxy a try. Ended up using cyanoacrylate (superglue) and that reduced the bubbles by 80-90%. Good enough for a short term patch. Just a quick update. Bubbles returned en masse yesterday. So the superglue patch lasted about a month... I'll probably clean it up and redo tomorrow, since I don't have a replacement yet. No worries... I'm currently shopping variable speeds along with SWGs. This is just a stopgap rather than spending $40 on a new lid. Yikes, $30 for a pump lid, and $10 for an o-ring? That lid would annoy me. How old is the pump? Maybe time for a new one. It's old... Was with the house when I bought it, so I don't know exactly how old. I replaced the motor a few years back when the last one died. Not sure if that was the original, or a prior replacement. I am planning a replacement for a couple of reasons. The 3/4hp is marginally sized for my pool. It heat cycles on really hot days. And I want a variable speed so I can run more hours at low power for a SWG. FWIW, in yesterday's patch I put some fiberglass cloth across the crack, and glued it all in place. I think I got better adhesion because I roughed up the polycarbonate and use a hexane "primer" to help with adhesion. Today there are zero bubbles. I think this will work until I get a new pump installed.